Nothing affects the modern economy (and society) more than decisions made in the market place, especially, but not only, decisions made by consumers. Although it is not startling to suggest that decisions made in production are affected by choices consumers make, consumers have long been viewed, not only by academic economists, as individual, isolated rational actors that make or refrain from purchases purely on the basis of narrow financial considerations. Markets are not and never were morally neutral. Market relations have always had an often taken-for-granted moral underpinning. The moralization of the markets refers to the dissolution and replacement of the conventional moral underpinnings of market conduct, for example, in the music market, financial markets, and corporate governance. It further implies not only the heightened importance of new ethical precepts, but the significant change in the role of moral ideals in market behavior. These profound transformations of economic conduct are accompanied and co-determined by societal conflicts. The moralization of markets represents thus a new stage in the social evolution of markets. 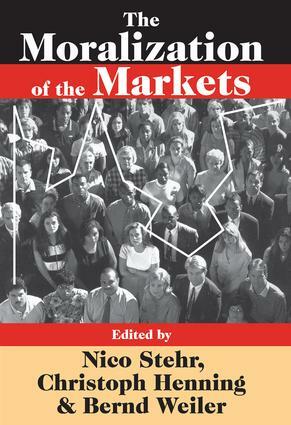 The book is divided into four parts, in which the twelve chapters, written by contributors from different social science disciplines, deal with the context of the moralization of the markets; the major social institutions; and present case studies that examine European and American attitudes and behavior towards tobacco and GMO; expansion of the private and ethics in business; and how workers respond to the new corporate norms. This volume will be of interest to sociologists, economists, social scientists, and the general consumer alike. The Market: Source or Target of Morality?